Sure, the poll wasn’t completely unanimous, but we as Americans all (pretty much) agree on some things, like non-flooded hospitals. Why the erosion in trust? For one thing, twice in the last 18 years our country didn’t send to the Oval Office the person who won the national popular vote. The electoral system doesn’t incentivize candidates to pay attention to national issues: In 2016, the candidates (and the public) knew that the presidential election would effectively be decided by the voters of only 11 states. 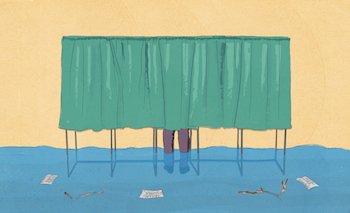 There’s a potential solution here, as common-sense as flood-proof hospitals: make every vote count.